Go to original pattern for design DROPS 153-7. Knitted DROPS jacket in garter st in "Fabel" and "Delight". Size: S - XXXL. DROPS CIRCULAR NEEDLE SIZE 4 mm (80 cm) - or size needed to get 21 sts x 40 rows in garter st = 10 x 10 cm. 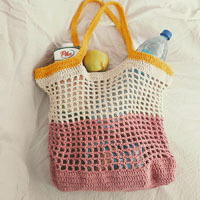 You can get the yarn to make this pattern from	15.80£. Read more. *1 ridge Fabel, 1 ridge Delight *, repeat from *-* the entire piece. Dec 1 st before marker as follows: Work until 2 sts remain before marker, slip 1 st as if to K, K 1, psso. Dec 1 st after marker as follows: K 2 tog. Inc 1 st on each side of every marker as follows: Work until 1 st remains before marker, make 1 YO, K 2 (marker is between these sts), make 1 YO. On next row K YOs twisted (i.e. work in back loop of st instead of front) to avoid holes. Cast on 184-200-220-240-264-288 sts on circular needle size 4 mm with Delight. Work in GARTER ST and STRIPES - see explanation above. Insert 2 markers in the piece; 46-50-55-60-66-72 sts in from each side (back piece = 92-100-110-120-132-144 sts). REMEMBER THE KNITTING TENSION! When piece measures 4 cm, dec 1 st on each side of each marker - READ DECREASE TIP ABOVE! Repeat every 2 cm a total of 8 times = 152-168-188-208-232-256 sts. When piece measures 24 cm, inc 1 st on each side of marker in each side - READ INCREASE TIP ABOVE. Repeat every 2-2-2½-2½-3-3 cm 6 times in total = 176-192-212-232-256-280 sts. When piece measures 39-40-41-42-43-44 cm, cast off 6 sts for armholes in each side (cast off 3 sts on each side of marker), and finish each part separately. = 82-90-100-110-122-134 sts. Then cast off for armholes in each side at beg of every row as follows: 2 sts 1-2-4-6-8-10 times and 1 st 0-1-1-1-2-3 times = 78-80-82-84-86-88 sts. When piece measures 54-56-58-59-61-63 cm, cast off the middle 30-30-30-32-32-34 sts for neck and finish each side separately. Continue to cast off 2 sts on next row towards the neck = 22-23-24-24-25-25 sts remain on the shoulder. Cast off when piece measures 58-60-62-64-66-68 cm. = 41-45-50-55-61-67 sts. Cast off for armhole in the side as on back piece = 39-40-41-42-43-44 sts. When piece measures 47-49-50-52-53-55 cm, cast off sts for neck. Cast off 8-8-8-9-9-10 sts, then cast off 3 sts 1 time, 2 sts 2 times and 1 st 2 times = 22-23-24-24-25-25 sts remain on shoulder. Cast off when piece measures 58-60-62-64-66-68 cm. = 41-45-50-55-61-67 sts. Work as left front piece but reversed. Worked back and forth on circular needle. 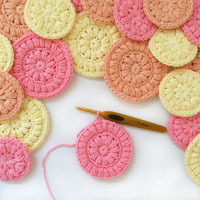 Cast on 46-48-50-52-54-56 sts on circular needle size 4 mm with Delight. Work in garter st and stripes as before. When piece measures 10 cm, inc 1 st inside 1 edge st in each side. Repeat every 3-2½-2½-2-1½-1½ cm 12-14-15-17-19-20 times in total = 70-76-80-86-92-96 sts. When piece measures 48-48-47-46-44-43 cm (NOTE! 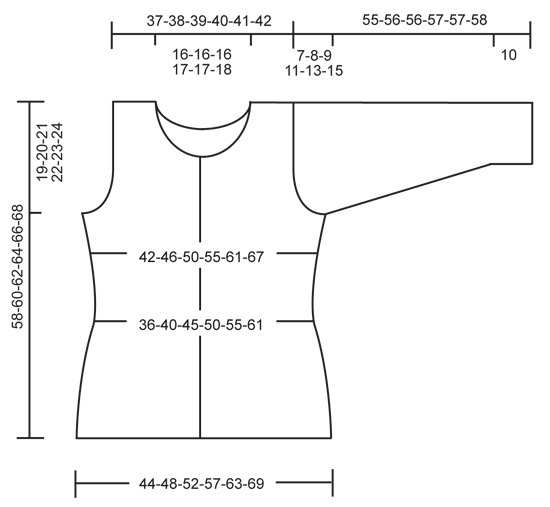 Shorter measurements in the larger sizes because of longer sleeve cap and wider shoulders), cast off at the beg of every row for sleeve cap as follows: 4-4-4-3-3-3 sts 1 time, 2 sts 3-4-4-4-4-4 times, 1 st 0-1-1-3-8-11 times, then cast off 2 sts in each side until piece measures 54-55-55-56-56-57 cm. Cast off 3 sts in each side, then cast off the remaining sts. Piece measures approx. 55-56-56-57-57-58 cm. Sew the shoulder seams. Sew in sleeves and sew sleeve seams. Pick up 94-108 sts from RS with Fabel on circular needle size 4 mm along neck edge. Work 1 ridge and cast off with K from WS. 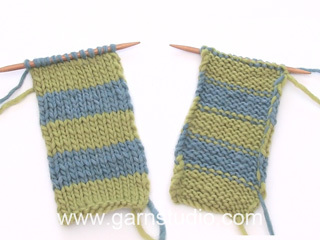 Work back and forth on needle in garter st and stripes. Pick up 98-102-106-110-112-114 sts inside 1 edge st mid front on right front piece with Delight. K 1 row from WS. On next row from RS, dec for 6-6-6-7-7-7 buttonholes as follows: K 7-6-5-8-4-6, * K 2 tog, make 1 loose YO, K 15-16-17-14-15-15 *, repeat from *-* 4-4-4-5-5-5 more times (= 5-5-5-6-6-6 times in total) and finish with K 2 tog, 1 YO and K 4. On next row K YOs. Continue in garter st and stripes until band measures approx. 2-2-2-3-3-3 cm, loosely cast off all sts. Work as right band but without buttonholes. Sew on buttons. Sleeve cap, pattern says “then cast off 2 sts in EACH SIDE until piece measures 54-55-55-56-56-57 cm.” Does this mean cast off at both ends of every row? My sleeve cap is very short if I do this. 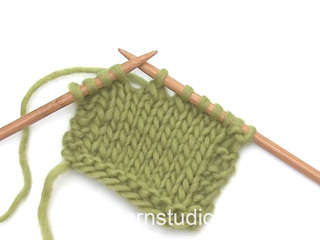 I am so sorry to be dense (I am a novice knitter) but my next row starts at the armhole end , so if I cast off at the start of the row here that looks odd. 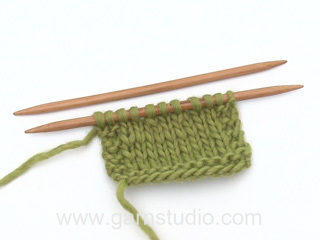 I have just started off in Fabel, knitted 25, cast off 30 and knitted 25. I now have two lots of 25 stitches separated by the neck. My next row is in Fabel, starting at the armhole. I am completely stuck! Dear Mrs Bellamy, after you have worked the row casting off the middle sts for neck, turn and work next row from armhole towards neck over 1st shoulder, then, at the beg of next row (= from neck towards armhole), cast off the first 2 sts, work row to the end = 25 sts remain. Then continue back and forth over these sts until finished measurements and cast off sts for 1st shoulder. Work now second shoulder over the remaining 25 sts the same way ie at the beg from first row from neck towards armhole, you will cast off 2 sts = 25 sts remain, continue until you have worked same length (= same number of rows) as for 1st shoulder and cast off. Happy knitting! Hello, I am just casting off the middle 30 stitches in the middle of the back piece. I have 25 stitches on my needle, then the neck section and another 25 stitches on the needle in my hand. Please could you explain the next instruction? “ Continue to cast off 2 sts on next row towards the neck ”. Thank you. Dear Mrs Bellamy, work now each shoulder separately, at the beginning of next row from neck towards armhole cast off 2 sts, then continue until piece measures 66-68 cm and cast off. Take the sts from other needle back on needle and work the same way, ie at the beg of row from neck towards armhole, cast off 2 sts and continue until piece measures 66-68 cm. Happy knitting! Dear Mrs Axworthy, the sleeves are here shaped on the cap, so that it might be easier to work them bottom up as in the pattern. Happy knitting! 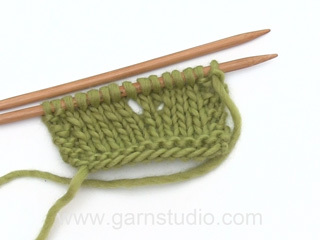 Dear Mrs Gaunt, you bind off for armholes at the beg of every row (= both from RS and from WS) 2 sts 4 times and 1 st 1 time (in size L), ie you will bind off 2 sts at the beg of next 8 rows (= 8 sts bound off on each side) and 1 st at the beg of next 2 rows (= 1 st bound off on each side) = a total of 18 sts will be bound off for armholes, there were 100 sts before armhole = 100-18= 82 sts remain. If you work size XL, bind off 2 sts at the beg of next 12 rows (= 12 sts bound off on each side) then 1 st at the beg of next 2 rows (= 2 sts bound off on each side), 110 sts - (12x2 + 2)= 84 sts remain. Happy knitting! 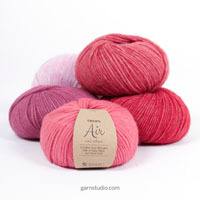 Dear Sheila, since you are working garter stitch with stripes alternating 2 kind of yarns and colours, right and wrong side will look differently. Happy knitting! Having real problems with the sleeve decreases. I've checked the maths and the pattern has 26 rows in 1st decrease section (end up with 54 sts) which leaves a maximum of 24 rows for the rest. According to the tension this is 12.5cm, which is what I've got, but the armhole length on the back and fronts is 23cm so it's way too short. Should the middle decreases be 1st per row, not 2sts? Dear Maggie, you cast off for sleeve cap at the beg of every row on each side: 4-4-4-3-3-3 sts 1 time, 2 sts 3-4-4-4-4-4 times, 1 st 0-1-1-3-8-11 times, then cast off 2 sts in each side until piece measures 54-55-55-56-56-57 cm (the number of sts cast off will depend here on how many rows you need to reach the given measurement for your size, make sure that you will cast off the same number of sts on each side). Then cast off 3 sts in each side, and cast off the remaining sts. Happy knitting! Hi - in the sleeve instructions it says " cast off at the beg of every row for sleeve cap as follows: 4-4-4-3-3-3 sts 1 time, 2 sts 3-4-4-4-4-4 times, 1 st 0-1-1-3-8-11 times." Can you confirm that each of these is to be done on each side. Also, the Neck Edge says to pick up 94-108 sts. I'm doing the second largest of the 6 sizes. Can you confirm how many stitches I should pick up? Is it right that this is different to the right band which is 98-114 sts? Thanks! Hi Maggie, yes, you cast off for sleeve cap at the beginning of each row as described in the text - so the numbers given are x 2. If you think of the number of stitches to be picked up around the neck as a scale, then 106 sttches for your size should be right. The band is along the front piece edge, so is different from the neck and therefore the number of stitches picked up will be different from the neck. Happy knitting! Seascapes Drops...Ik heb de steken gecontroleerd en cm , te veel steken voor de aangegeven maten en veel te wijd, echt meer dan 40 cm wijkt het af bij L . Dus weg garen. Ik weet niet voor welk land en omvang vrouwen dit is ontworpen maar niet voor ons. Het ontwerp in centimeters eronder klopt niet met patroon. Ik baal ontzettend van de aankoop, want ik kan er niks mee. Bonjour! Je désire tricoter le modèle 153-7; j'ai de la laine Delight no. 13 rouge-orange-gris et j'aimerais avoir une idée avec quelle autre laine je pourrais l'agencer. Le patron indique la laine Fabel, j'ai noté la couleur 672-bourgogne. Est-ce qu'elle a du gris charcoal ? Merci de votre attention Félicitation pour vos beaux modèles, instructions et vidéo et vos fils! Bonjour Mme Delisle, pour toute aide à choisir une couleur, nous vous invitons à prendre directement contact avec votre magasin DROPS, même par mail ou téléphone, il pourra vous conseiller plus facilement et de façon plus personnalisée. Bon tricot!